with Alec Carter, Grade 1, George Vanier Public School and Chelcey Perfetto, Grade 5, Jessie Hamilton Public School. 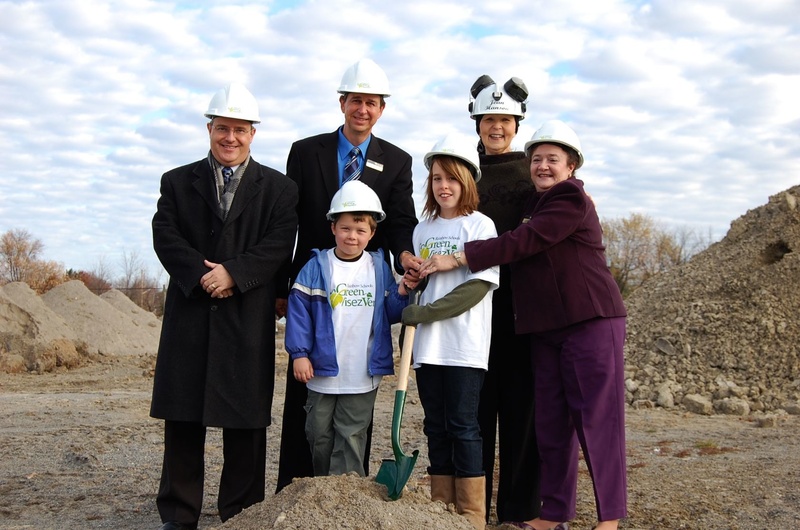 Rainbow District School Board held a sod turning ceremony today to mark the start of construction of its second green school. Located on Sixth Avenue in Lively, the school will offer English and French Immersion programs for students in JK to Grade 6 from George Vanier Public School and Jessie Hamilton Public School. There are many benefits to building high performance facilities, from education, environmental and economic perspectives. “Go green features protect the natural environment, provide a healthy, hands-on place to learn, reduce energy consumption and operating expenses, and make new schools exceptional learning and teaching tools for students and staff,” said Rainbow District School Board Director of Education Jean Hanson. “As Rainbow District School Board begins construction of the new school in Sudbury West, they continue to set a green standard for others to follow,” said Tim Dettlaff, Senior Vice-President of Asset Management for Ameresco Canada. The new school in Sudbury West will accommodate 500 students in 49,247 square feet over two floors. The school will also house a daycare facility. Castellan James + Partners Architects Inc. is designing the school. Ameresco Canada Inc. is overseeing the construction with a targeted completion date of the fall of 2009. Architect Castellan James + Partners Architects Inc.